A punching bag is a useful item in any home. When you have had a tough day, and feel the frustration levels rising inside, taking your feelings out on a punching bag can provide relief from your tension. It also provides an excellent aerobic workout, and strengthens your arms and shoulders. 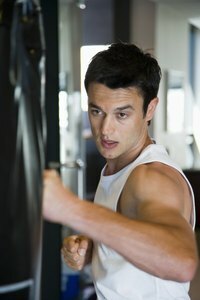 Practice throwing punches is required for training as a boxer and useful for those learning karate or other martial arts. If you do not have access to a standard punching bag, you can use pillows and some household items to come up with your own. Pour 5 pounds of sand into each of four pillowcases. Use duct tape to securely fasten the top of the pillowcases, keeping the sand bags tight. Place the sand bags inside a large duffel bag, spacing them evenly. Fill the rest of the duffel bag with old pillows, packing as tightly as you can. Zip the bag shut. Run bands of duct tape around the duffel bag, circling the top, middle and bottom. Tape a strip of tape over the zipper. Loop rope through the bag's handle, and use duct tape to fortify the knot by covering it completely.